The name Charles Dickens epitomizes 19th century living in London, and to date is a familiar household name in not just England, but all over the world. Famous for works such as A Christmas Carol and Oliver Twist, Dickens touched the heart of a nation, having survived the very horrific scenes that he described in his works. Charles Dickens was born to a Naval Pay Office clerk on February 7, 1812, in Portsmouth. His family was constantly on the move and in financial difficulty. At just the age of twelve, Dickens was put to work in a factory after his father was arrested for debt. One of many siblings, the family was in constant turmoil and money was always an issue. Earning just six shillings a week in a boot-blacking factory, Dickens learned life the hard way and experienced neglect, poverty, and slavery firsthand. Fortunately for Dickens, the economy improved and allowed him to return to education with him gaining his first job on leaving school in a solicitor’s office. The turmoil of his early childhood had however had a profound effect on him, the grim tales he told in his works being a true representation of what it was like to live in 19th century London below the poverty line. Charles Dickens learned shorthand in his early career and worked as a reporter for the Morning Chronicle. He published his first novel – The Pickwick Papers in 1836. Other early works to follow his initial success included Oliver Twist, Nicholas Nickleby, and Barnaby Rudge, published in 1837, 1839, and 1841 respectively. Later, in 1841, he traveled to America where he caused controversy by avidly supporting the abolition of slavery. 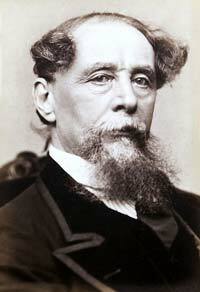 In 1858, Dickens was to divorce his wife, Catherine, who he had ten children with. Later works included David Copperfield, A Christmas Carol, A tale of Two Cities and Great Expectations (in 1860 – 1861). The profound effect of his early life would be shown through his prominent views on social criticism, his life being unraveled to the reader through his excellent fictional publications. Throughout his career, Charles Dickens would write 15 novels as well as a large number of articles and short stories. He died on June 9, 1870, his wish being to be buried as he was born, with no fuss or fanfare. He wished for his body to be buried at a small cemetery in Rochester, but the British nation would not allow for such a prominent figure of their time to be buried in such a way. Instead, Dickens was buried in Westminster Abbey in London, where thousands of mourners flocked to his grave to offer gifts of flowers to his open grave. Overflowing with bouquets, his grave symbolized his life from start to finish, many poor mourners choosing to wrap wild flowers in rags to lie alongside the richest of gifts from the upper classes.